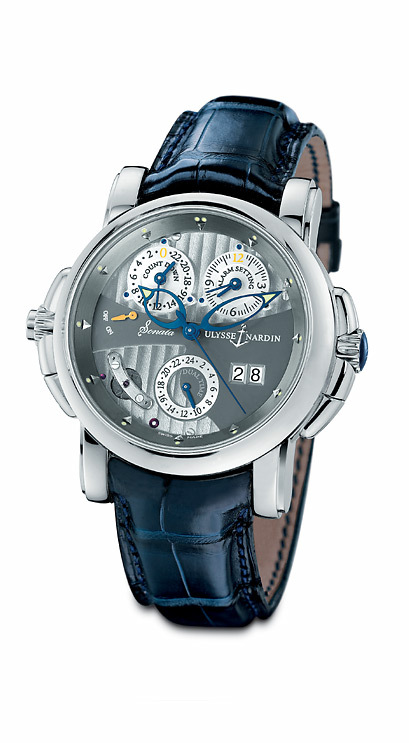 Ulysse Nardin proudly unveils the Sonata, a unique and amazing multifunctional mechanical instrument. It is an in-house development, inspired by Dr. Ludwig Oechslin, constructed by Pierre Gygax and Lucas Humair, executed by the UN Dream Team conducted by Rolf Schnyder. The in-house engineers and technicians of Ulysse Nardin spent nearly seven years on the development of this patented self-winding in-house caliber. It combines the novel Alarm setting with a Countdown indicator and the Dual time system with the instant time zone adjustor conceived by Dr. Oechslin and featured in many Ulysse Nardin watches. This patented Dual time function permits time zone adjustments forward and backward by simply pressing the pushers plus (+) or minus (-) to change the position of the hour hand. The original home time (reference time) stays displayed while the date, the Alarm and Countdown adjust automatically when a time zone adjustment is made. The melodic chiming of the Alarm is based on a novel 24 hours mechanism which allows setting the Alarm 23 hours ahead, for 7.35 pm the same day or 7.35 am the next day. The Sonata will be available in red or white 18kt gold and comes with a deployant clasp. The case is individually numbered and water-resistant to 30 meters.